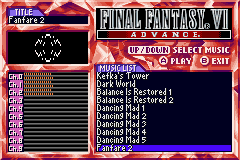 This hack, that could also be called “FF6 advance as it should have been”, basically replace the music with the original music from the SNES version (gone the aggressive fuzzy instruments). 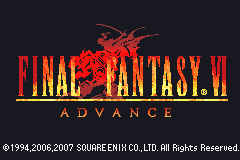 The framerate drops, although not entirely suppressed, are greatly reduced, so this version plays almost as smoothly as the SNES original. All 3 releases of the game (Japan, America, Europe) are supported. The opera songs can optionally be patched to have true opera soloists, and the major part of the opera tunes are played by Tokio’s orchestra (European version of the ROM only). I can’t believe how much praise this hack gets considering it introduces a horrible hissing static whenever it plays music in every version, even the most updated. Playing with the vanilla sound is much preferred if you’re not deaf.